What is said to be the largest exhibition of Steampunk art, craft and engineering in the world has come to London for the next few months and goes on display surrounded by real Victorian steam engineering at the Kew Bridge Steam Museum. If you are not familiar with Steampunk (one of my friends had never heard of it when I mentioned the other evening), then in brief, it could be described as the art of making models of what modern engineering might look like, if it retained the aesthetics of Victorian engineering. It goes beyond that though, and has a whole cultural subset within it of a desire to return to more courteous ways – such as holding doors open for people, not because ladies are feeble, but because letting the door slam in the face of the person behind you is a bit rude. We need some steampunk etiquette at Canary Wharf shopping centre, where holding doors open seems to be a forgotten skill. 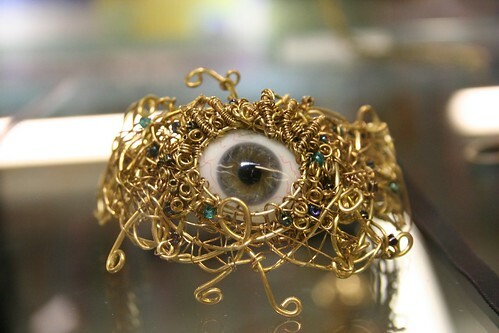 There is also clothing, jewellery, even a laptop computer (arriving soon) – anything really that could be redesigned in the genre. 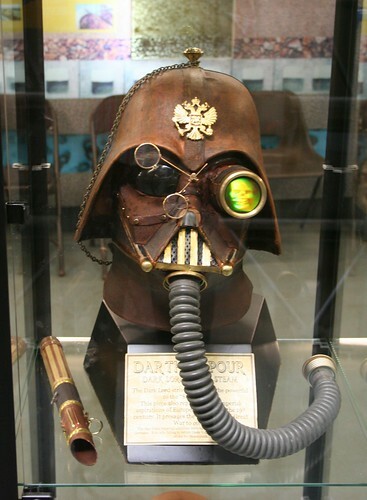 Because the collection itself draws on Victorian engineering aesthetics, some of the exhibits are dotted around the museum outside their display cases – so you might look at something and not be entire sure, is it Victorian or is it Steampunk? 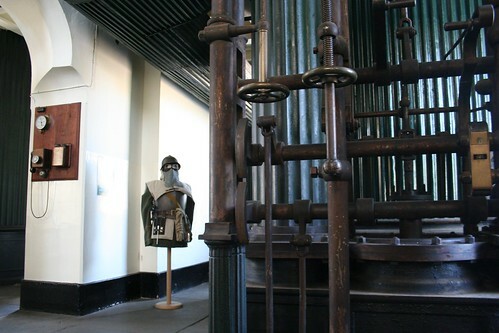 Protective clothing from the steam and heat - or steampunk? 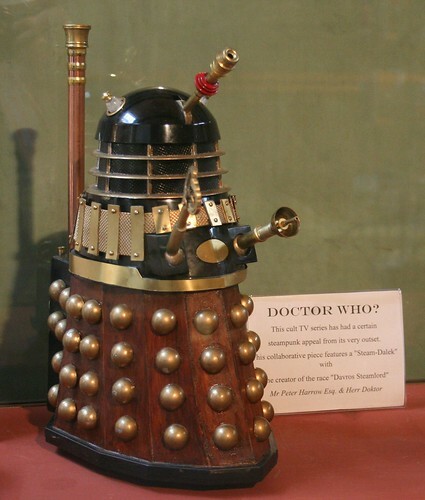 Some of the exhibits are undeniably modern though – unless they really had Daleks in Victorian England? Steampunk Dalek - looks a lot scarier than the Fisher Price coloured Daleks on TV now. 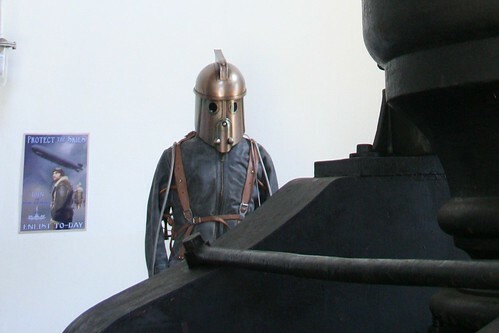 According to the press blurb: The exhibition will contain over one hundred Steampunk exhibits from all over the world, ranging from paintings and artworks through costumes and fabrics to machines and engines, together with sound installations and short films. Many of the exhibits have been specially created for the exhibition and have never been seen before. It’s worth noting that not all 100 exhibits will be on display at the same time – and they have a large delivery arriving from the USA in a couple of weeks. So if you turn up tomorrow, when the exhibition opens, expecting to see all 100 in one place, then you might be disappointed. The aim is to have the display constantly rotating, so as some items arrive, others are removed. Fortunately, the admission fee for the museum (£9.50) includes unlimited return visits for a year, so if you go this weekend, then you can go back again when the USA exhibits arrive, and again a month later when the displays are changed again, etc. There will be also a Steampunk music concert, a fashion show, and science event during the exhibition, and I will naturally mark them in my events calendar, so those might be the best days for return visits. K-1909 - design based on an early Singer Sewing Machine? 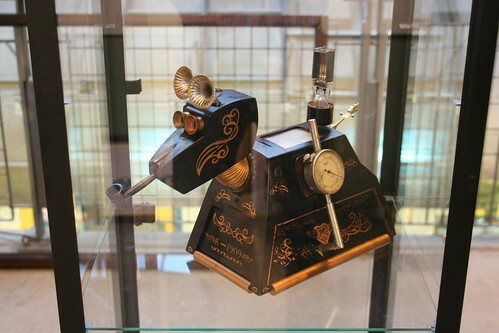 The exhibition, which is organised jointly by the Kew Bridge Engines Trust and the Victorian Steampunk Society, follows last year’s very successful show at the Museum of the History of Science in Oxford but is on a much larger scale. After the show closes at the Kew Bridge Steam Museum some of the exhibits will be going on show elsewhere in the UK, but Kew Bridge is the only place where the whole show can be seen together. Here is a game – one of the photos in this blog post is NOT Steampunk. Can you guess which one? The rest of the photos in my gallery. 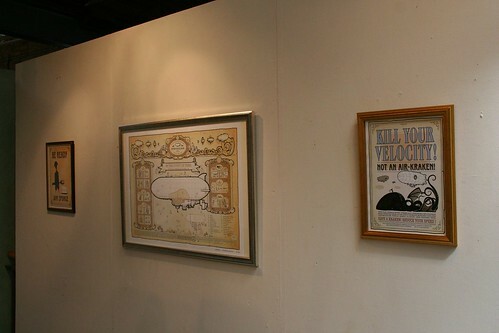 The exhibition runs from tomorrow (Sat 4th June) until Mon 29th August – open from 11am to 4pm every Tuesday to Sunday. Closed on Mondays, except Bank Holidays. The rotative steam engines run most weekends, but the best dates to visit to see the really big steam engines working are: 25/26 June; 23/24 July and 27/28/29 August. Full calendar here. Canary Wharf station on the other hand is the only place where I have seen people queueing neatly for all the doors on the tube trains and queue jumpers reprimanded. Is there anywhere else on the underground like that or is it just because there is enough space at Canary Wharf. People may “queue neatly” at the tube station, but they haven’t quite worked out how to queue so that they don’t block the doors for people getting off trains during the evening rush hour – despite many attempts to educate people as to the folly of standing right in the middle of the doors. Visiting the UK this summer, and this will definitely be on my itinerary. Splendid. I’m guessing all those dials are from authentic steam technology. The Triple Expansion engine is an extremely efficient mchine. The one at the museum was originally a pump used to draw water, but they were most often employed on ships. High pressure steam is drawn into the first cylinder, then instead of being condensed and returned, the remaining (lower pressure) steam passes onto the second and then the third cylinders before whatever is left, at low pressure, is sent off, so it uses the steam more efficiently, providing a higher throughput. The dials you see read such things as vacuum and, pressures in the three cylinders and so on, which is why there are so many on that panel. This and some of the other rotative engines are in steam almost every weekend. Well – what makes the dress ‘steampunk’? It’s little corset-like buckles? Perhaps, but I’m certain it would fit in very nicely on any given steamy airship~! 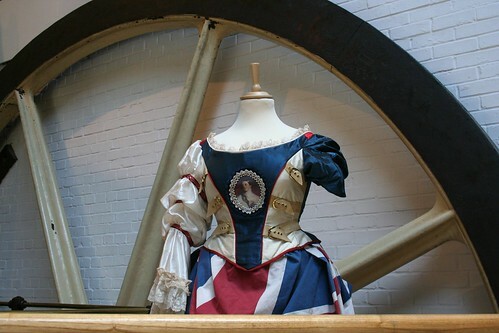 It is unlikely, and possible scanalous, that a real Victorian dress would be made up with the Union Flag forming the main part (although possible if it’s for Britania in a theatrical production) but this is fine in steampunk which is influenced by Victorian items, but doesn’t follow the rules on them to the letter. The leather corset like straps do add to the steaminess. Remember corsets in those days were undergarments NEVER to be seen by men – at least not whilst being worn by RESPECTABLE ladies. 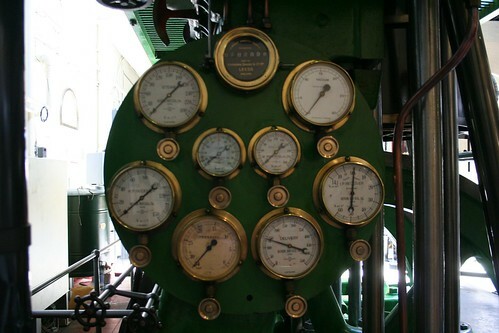 Re: your game challenge – I submit that the “dials” pic shows a genuine control gauge panel from a genuine steam-powered Something. It’s too purely and muscularly purposeful to be punk. Wish was possible to attend this show. I like your site very much, but it fills me with reminiscent and unrequiteable yearnings.